Penang has become a popular weekend getaway for its nice beaches and street food. There are a few ways to go from Singapore to Penang: by train, by bus or by flight. Let’s compare the cost and time spent on travelling to Penang by each of these modes of transportation. First, let’s talk about the slowest way to Penang by taking the KTM train from Woodlands Train Checkpoint. Getting to the train checkpoint means taking a taxi or one of these public buses: 170, 170A, 178, 856, 903, 911, 913 and 950. For those who prefer to take the MRT train, we suggest that you alight at Woodlands station and walk to the nearby Woodlands Temporary Bus Interchange to take one of these buses: 856, 903, 911 and 913. At Woodlands Train Checkpoint, where your train journey starts, take the KTM shuttle train to JB Sentral. 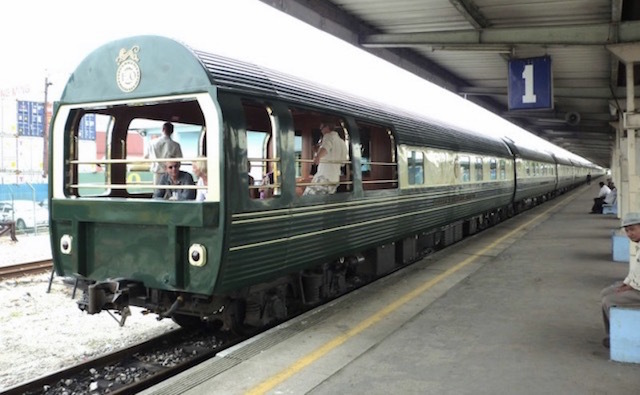 The KTM shuttle service is not very frequent and you will have to check to confirm the timing and book your train ticket online in advance online so that you do not waste too much time waiting for your connecting train. Here’s the KTM shuttle timing at the timing of writing: 8am, 10am, 12 noon, 1.30pm, 4.30pm , 6pm, 6.45pm, 8pm, 8.45pm, 10pm and 11.15pm. The shuttle train fare costs SGD5 and is a short 5-min train ride across the Causeway from Woodlands Train Checkpoint to JB Sentral. Taking this shuttle train, you can avoid the queue and traffic jam at the both the Singapore and Malaysia custom and immigration checkpoints at the Causeway. There are 4 departures from JB Sentral to Gemas: 8.45am, 10.10am, 7pm and 23.40pm. The KTM train will take between 4 and 5 hours to arrive Gemas and the train fare is MYR21. There are 3 departures from Gemas to KL Sentral: 3pm**, 4pm and 4.30am. The train fare from Gemas to KL Sentral is MYR31 and takes about 2.5 hours. **You can take the 3pm train from Gemas to Butterworth(arrives at 9.45pm), saving you a transfer at KL Sentral. If you plan to travel without a stopover at Kuala Lumpur then you’ll have to take the 8am train from Woodlands Train Checkpoint and transfer at JB Sentral to take the 10.10am train to Gemas by 2.45pm. The train leaving Gemas at 3pm will arrive Butterworth at 9.45pm. There are 5 departures from KL Sentral to Butterworth: 9am, 11.30am, 4.13pm, 7.53pm and 9.30pm. Depending on the timing of the train you’re booking, the train fare is MYR59 for ETS Gold and MYR79 for ETS Platinum(meal included). The train journey from KL Sentral to Butterworth takes between 4 to 4.5 hours. The train from KL Sentral will take you to Butterworth, after which you will take a ferry to Georgetown on Penang Island. Follow the direction sign at the entrance of the train station to walk to the ferry terminal. The ferry operates from 5am to 12 midnight at 20-30 min interval. The ferry crossing takes about 15 min and cost MYR1.20 which you’ll have to pay in coins. 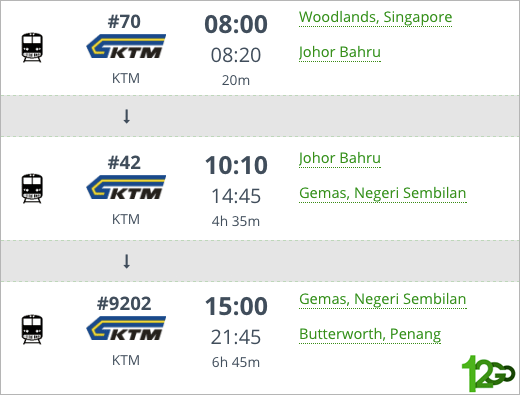 The entire train journey from Singapore to Butterworth will take about 14 hours and cost SGD5+MYR104(about SGD39 in total) plus ferry time and cost. Train travel may not be for every one, you will need more patience to appreciate and enjoy the train ride from Singapore to Penang. Alternatively, taking an express bus is faster and may be cheaper. It’s going to be a long bus ride to Penang from Singapore, you’ll be travelling more than 700km. So be prepared to spend 10 hours or more on the bus. As such you may want to consider booking a night bus that departs Singapore between 9pm to 10pm and arrives Penang in the morning between 6am to 8am. The one-way bus fares from Singapore to Penang cost between SGD35 and SGD61 depending on the bus companies and the pick-up point most convenient to you. If you’re looking for a reputable and trusted express bus service then go with Sri Maju, a bus company highly rated by Easybook.com and in our opinion, one of the the best express bus services from Singapore to Penang. From Singapore, there are several pick-up points including Golden Mile Complex, Golden Mile Tower, Lavender MRT, Kitchener Road, Serangoon Road, City Plaza and Boon Lay. All long-distance express buses terminate at the Sungai Nibong Bus Terminal, which is about 10km from Georgetown. Alternatively, you may want to break up the 10-hour journey into something more manageable by stopping over at Kuala Lumpur where you can have a meal, do some shopping or even check out the nightlife in KL. There are many express bus services to choose from when travelling from Singapore to Kuala Lumpur. The bus ride will take about 5 to 6 hours. As for the second part of the journey, from Kuala Lumpur to Penang, it will be another 5 hours. As the Kuala Lumpur to Penang bus trip, the fares are very competitive and there are many departures throughout the day. However, if you’re in a hurry, the faster way is to fly from Singapore to Penang. A one-way air ticket from Singapore to Penang could cost as little as SGD79 when you’re travelling light and do not have checked-in baggage. The main advantage of traveling by air to Penang is time saved. The flight time from Singapore to Penang is usually less than 2 hours compare to 10 hours by express bus and even longer by train. Thanks to Jetstar, Tigerair and Air Asia, there are now a number of cheap flights to Penang from Singapore on a daily basis. To find the best cheap flights from Singapore to Penang, use Skyscanner to compare airfares and timing. Total cost: Between SGD79-SGD450. Airfares can start at as low as SGD79(including taxes) for Tigerair or Jetstar (no frills, carry-on baggage only). Airfares for premium airlines start at around $300 and go up to $450 (including taxes) for return flight + airport transfer to final destination. Now, which way would you travel from Singapore to Penang: train, bus or flight? Tell us what you think in the comment box below.